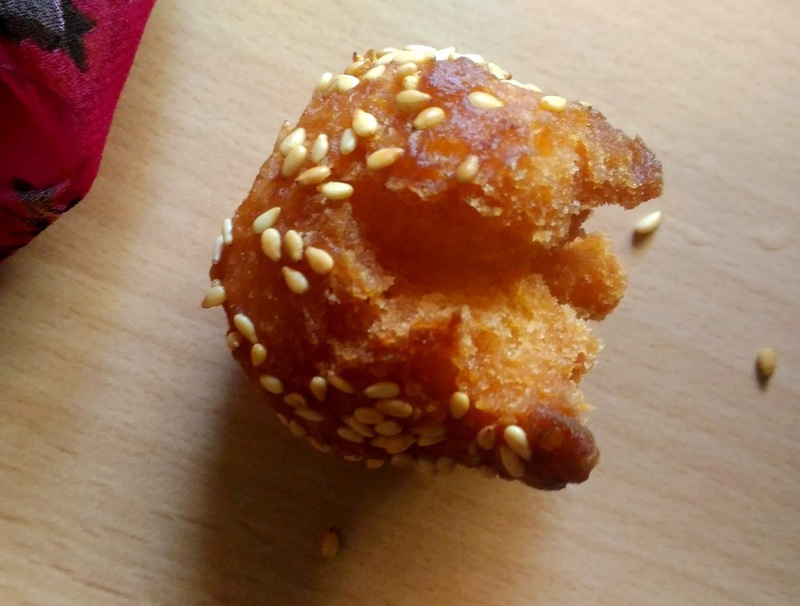 Why not try an International recipe yet strongly Indian as an additional sweet for this Diwali? 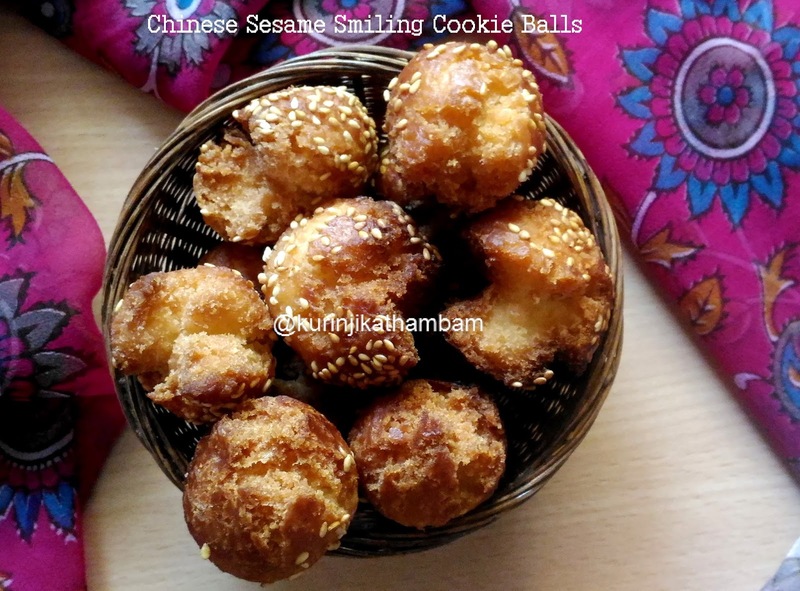 Chinese Sesame Smiling Cookie Balls seems to be a variant of our local tea shop vettu cake (I have already posted HERE). Its also easy and it came out very well. My strong recommendation for second sweet for Diwali. 1. Sieve maida, corn flour and baking powder together for 2 times. Keep it aside. 2. In a bowl, add warm water and sugar. Mix them well till the sugar dissolves completely. 3. Now add the butter, salt, vanilla essence and curd with the sugar mixture. Mix them well. 4. Add sieved maida mixture (from 1) little by little and mix with spoon. 5. Now knead the mixture into a soft, pliable and non sticky dough. Add little water if you need. Cover the dough for 15 mins. 7. Roll each ball into sesame seeds. If the dough is too dry, apply little water on the surface of the balls then roll into sesame seeds. Do this step for all the balls. 8. Heat the oil in a pan, add the balls one by one slowly. Keep the flame in between sim and medium. Slowly the balls will rise and open by itself. Flip them using the ladle for uniform cooking and cook till they become golden in color and sizzling sound stops completely. 9. Take them out from the oil and drain the excess oil using the tissue paper. Cool it completely and store it in an air tight container. 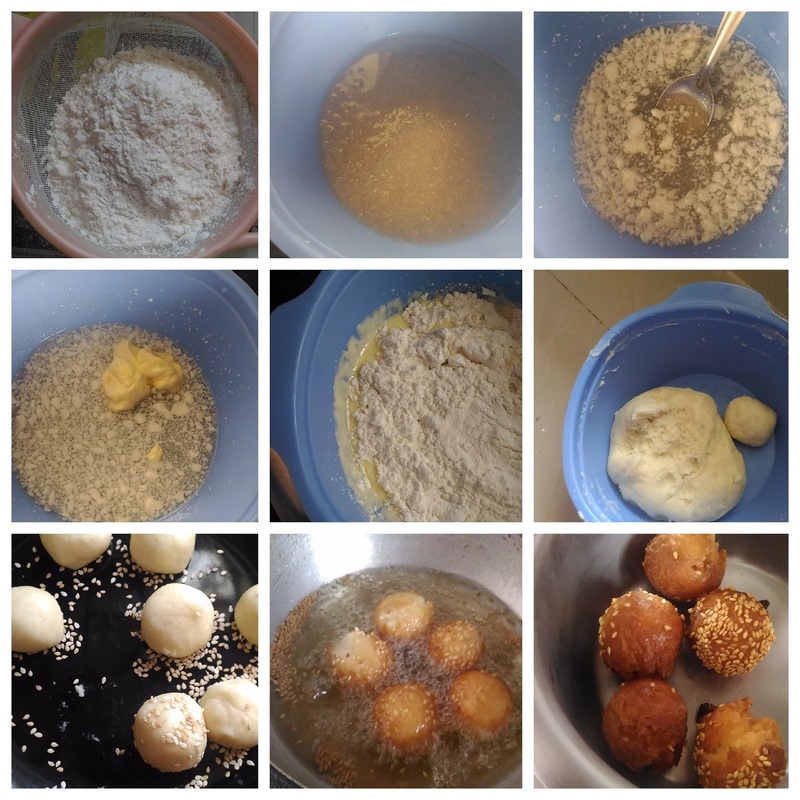 Delicious and yummy Chinese Sesame Cookie Balls / Chinese Sesame Fried Balls are ready to serve. 1. Don’t overload the oil with the balls. 2. If the dough is too soft, add little maida and make non sticky dough.